My heart just melted, brb need to find a new lolicon heart for replacement. The producers said that Chino's move at the rock-paper-scissors portion changes per episode. Go play with her! Oh right, I got into college so...yeah, anyone got any advice for freshman over here? "It's not now much time you have. It's how you use it." Seeing the chaos, Yumeji decided that retreating was the best idea. "Hey Yumeji, isn't it a bit noisy outside?" "It's nothing much mom, just some competition against the cafe next door or something..." "What?! A competition, and I wasn't notified?!" His mother walked out towards the competition area while he took the back door to leave. "Oyo? Senpai?" Sharo who was wearing a black dress with a popsicle on hand waved at Yumeji. "What are you doing here?" "Just having a nice walk since being at home is boring. How about you senpai? What's with that neat attire?" She clung to his arm. "It's a uniform for my job. Hey, quit clinging! You might stain it!" "How rude, telling a girl she's dirty. Want a bite?" She pointed the popsicle towards Yumeji. "Hey, where's Tina and Yuki?" "They should be at home." "I see. Then I'll have senpai all to myself today~" Sharo had a big grin while pulling Yumeji's arm. "Hey, accompany me for a bit." "I still have work to do, so no." "Then if anything bad happens to me, it's senpai's fault~" "...Fine." With that, both of them headed towards the competition as spectators. "Here. This one's on the house." Yumeji hands Alex and Lisanna a box. "Thank you!" "You shouldn't have." "Nah, mom insisted." As he went back, Alex asked him a question. "So, you're with Suzuka huh?" "Shh! Don't say that aloud!" He rushed back and covered Alex's mouth. "It would be troubling if that guy also knows..." He points at the guy wearing a paper bag. "...It's just a family matter that's all." "Sounds like some romcom manga." Alex chuckles. As the chime on the door ringed, Yumeji got up. "Well, I still have work to do. Have fun with your sister." "Yeah." He waves. "Hello...?" Two familiar figures show up on the doorstep. "See Suzuka, it really was Yumeji~" "Mmm." "...Seriously?" 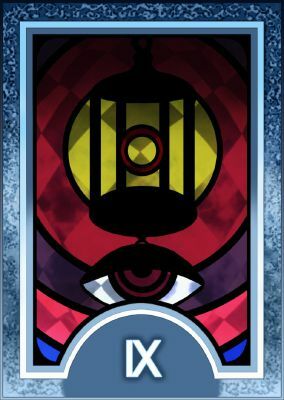 The Arcana is the means by which all is revealed. It requires great courage to look at oneself honestly, and forge one's own path..."
The Hermit is associated with wisdom, introspection, solitude, retreat and philosophical searches. You place yourself in situations that hide you from the public eye. Hermit individuals hide away from others or act in more supportive roles rather than putting themselves in the spotlight. Added an Ikazuchi&Inazuma character song featuring 'Refurbish', Futari no Shirushi! with your gift and dislike anyone who tells you what to do. the conveniences in your actions. Your cunning , smart , ruthless and a charmer. No one! Can stop you when you want something. You get it! Realizing that he's still in his butler uniform, Yumeji tries to finish the conversation as soon as possible. "Er, w-well I saw you and Medama heading further to town so I kinda deduced on where you guys were going and since it was Medama..." As he explains himself, Yumeji points at the map at the girls' hand. "As for knowing that she's looking for you, it's simple. Your house there has a heart-shaped symbol on top of it. Sorry for peeking." He bowed his head in apology as to which the girl replied to him while slightly blushing "It's nothing..."
"Hey dear customer, you still there?" "!!" Suddenly, a woman peeked out of the door at the cafe. Yumeji's face went a bit pale. "Oh? Yumeji, what are you-" Examining his clothes, the woman went silent as she walked to him. "Hey, your outfit..." She places her hands on his shoulders. "It looks soooooo good on you!!" "Guh..." Squeezing him like there's no tomorrow, Yumeji tried to push her away. "M-Mom, I still have work..." "Call me manager here! C'mon, stay here for a while! I'll just call your manager or something!" "D-Don't wanna..." In a split-second, a leg sweep made Yumeji lose his balance, enabling his mother to catch him. "L-Let go!" "It's just for a while. Oh, I remember! Tell me about your new girl! Suzuka, was it?" "Ah." The atmosphere froze as Yumeji realized that his supposed secret was immediately found out. "Here you go." He placed the coffee together with some sugar cubes and milk in front of her. "Thanks." As she slowly sips her coffee, she took out a piece of paper which looks like a map. Upon closer inspection, that map was this town's map and there are several scribbles here and there. "Uwah... I think I'm a bit lost..." She whispered to herself. "Hmm?" Being as subtle as possible, Yumeji looked at a certain mark. "I see." He comes near the girl. "Um, excuse me miss, but would you let me borrow your map for a second?" "E-Eh? Okay..." A bit reluctant, the girl gives him the map. "Lets see, where would two teenage boys go on such a fine day..." Recalling that Alex and Medama passed them by earlier, they shouldn't have gone too far from here. Removing all other possibilities, the only places left are the arcade, the park, the mall, and a maid cafe. "They didn't have any sports equipment, so the park's a no go. As for the mall, I highly doubt one of them would invite the other to go shopping. So, its the arcade or the cafe." He thinks for a while before making a decision. "Okay, since it's Medama, I'm more inclined on the cafe." Giving the map back to the girl, Yumeji went to the manager. "Hey manager, can I take an early break?" "Well, just get back as soon as possible. It won't be long till the peak hour." "Heh, as if the customer count would change." Without changing his clothes, Yumeji went over to the girl who was about to leave. "Hey miss, need some help?" "Thank you, but this bag isn't really heavy." "No, I meant with finding your brother." "One black coffee please." "Gotcha." After telling the order of the customer, the owner began to brew some coffee. Yumeji sat in the chair beside him whilst waiting for other customers. "You sure you're okay with paying me high? You're really not getting much customers you know." "It's fine. Compared to when I didn't have you, it's more than enough already. Here, take this." "Yeah yeah." Handing him the coffee, Yumeji placed it on the tray and proceeded on giving it to the customer before going back to his post. "See? They're talking about you. I guess the outfit did the trick after all." "This is kinda embarrassing you know..." Yumeji wore a butler uniform as prescribed by the owner of the small coffee shop. He was also forced to have a combed-up hairstyle. "Think of it as practice when you're gonna go to a job interview or something." "What kind of interview is it where I would be wearing a butler's outfit while giving coffee?" As the two of them chatted the time away, Yumeji noticed Medama and Alex on the streets. Why are they in school uniform? Before Yumeji could approach Suzuka, Tina called out to her which prompted him to hide. In her hands was something representing a polearm except that its blade is absent. "Um, Suzuka nee-san?" "Hmm? You're the girl dad was talking about... Tina, was it?" "Yes. I've been placed under the care of Yumeji's family, kinda like nee-san." She smiles before going back to her somewhat serious face. "Um, if it's okay with you, could we spar for a bit?" "It's okay... but will your body be able to hold on?" Suzuka, while supporting a poker face, sounded as if she knew her condition. "I already told Yumeji's father and he said that it's fine as long as I stop if I start getting tired." After setting the rice to cook, Yumeji went back to Tina and Suzuka and handed them some cold barley tea. "Here's some for you too." "..." He also hands a cup to Saya who nodded in thanks. "Sigh... I was no match for Suzuka nee-san after all..." "You're wasting too many movements... and you tend to fall for my fake openings..." Tina dejectedly lowers her head but Suzuka pats her. "But your ability to adapt in the middle of combat is a talent worthy of praise..." She smiles. "T-Thank you!" "..." Yumeji was silently drinking his own share of tea whilst listening to the two. "Yes, isn't she just beautiful?" "Pffft! W-What are you...! W-Well, if I had to say..." The beeping sound of his digital watch made him remember something. "Ah! I'll be late for my job! Sorry, but I'll leave breakfast to you!" "Didn't father say that-" Before Suzuka could finish, Yumeji already dashed off. "Nnnn~ Onii-chan went off already huh~" In his place, a sleepy Yuki slowly walked towards the stove. "Yuki, that's dangerous! Let me help!" "There should be no problems on finance... What a weird person..." "I believe its 'a mans thing.'" "..." Finally finished with the explanation of the current things to Yuki and Tina, Yumeji sits on his bed. Since Suzuka headed for the bath, he was able to have some time for himself after everything that has happened. "What the hell is this development?!" Just like in the mangas he read, Yumeji and Suzuka were already set on being married. He agreed since he thought that they would be given ample time to know each other, in which they would be able to talk it out if they were just being forced to do so. "And what's the plan of my parents on the distribution of rooms? With the addition of Tina, every room is now full!" But he already had a hunch on what the answer will be. "Living on the same room..." Suzuka's words from earlier suddenly appeared. "...This is bad." "Hey... I'm done." "Yeah yeah, I'll be-" Facing to where the voice came from, Yumeji saw a half-dressed Suzuka wiping her hair with a towel. Unable to get any words out, he sat there with his mouth open. "Fufu... Finally showed a normal expression..."
"T-This was for that?" It was pretty obvious that Yumeji was trying his best to act calm. "If you're that bad... It's better to just stop..." "Guh... A-Anyways, just put something... less-revealing already! Someone might misunder-" "Onii-chan~ Yuki needs help on this pro-" "Y-Yuki, wait for-" The words just as expected flew by Yumeji's head. "Fueeen~ Onii-chan doesn't need Yuki anymore..!" "U-Um, sorry for intruding!" Yuki suddenly fell to her knees and started crying while Tina dashed away. "W-Wait Tina! And Yuki, what are you saying!" "Fueeeen~!!" "This might just be... a bit fun..."